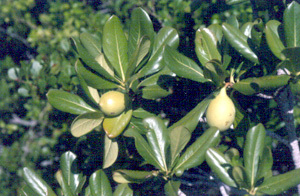 General Landscape Uses: Accent or specimen shrub or small tree along the coast. Buffer plantings. Availability: Widely cultivated. Available in Lake Worth at Amelia's SmartyPlants (561-540-6296). 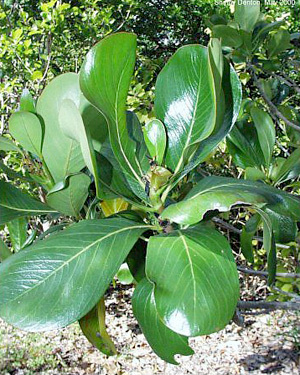 Description: Medium to large shrub or rarely a small tree with a dense rounded crown. Bark pale. Leaves large, shiny, 2-6 inches long. Dimensions: Typically 5-15 feet in height; to 25 feet in South Florida. 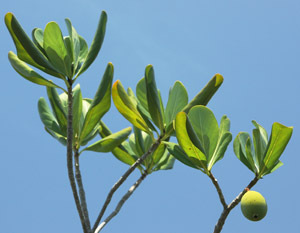 Usually about as broad as tall, especially when growing in full sun. Range: Monroe County Keys north to Broward and Lee counties; Bermuda, Bahamas and Cuba. For a digitized image of Elbert Little's Florida range map, visit the Exploring Florida website. Habitats: Coastal hammocks and thickets. Salt Wind Tolerance: Secondary line; tolerates significant salt wind without injury, but usually is somewhat protected. Flower Characteristics: Semi-showy, star-shaped. Dioecious, with male and female flowers on different plants. 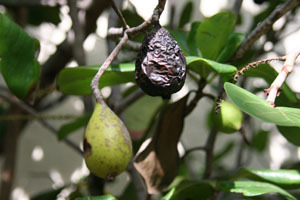 Fruit: Berry, green to gold at maturity, turning dark brown or almost black. Edible but not tasty. 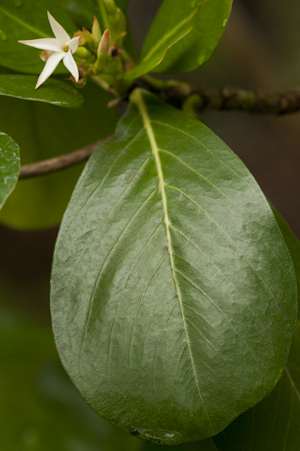 Wildlife and Ecology: Larval host plant for tantalus sphinx (Aellopus tantalus) moths. 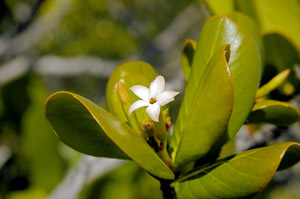 Nectar plant for mangrove skipper (Phocides pigmalion) and other butterflies. 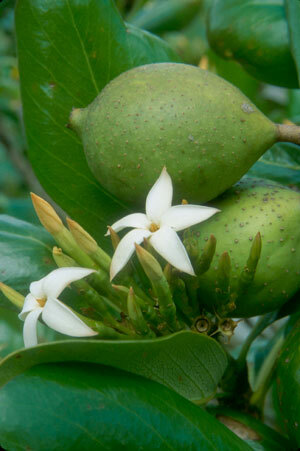 Comments: Although the flowers can be very attractive, the fruits can be downright ugly.